Catch Recruitment provides a wide range of recruitment services to a broad spectrum of clients across government, not-for-profit, health, education and the private sectors. We have developed a contemporary approach to recruitment – which results in a reliable, consistent delivery of services for our clients. Our sophisticated methodologies have been highly successful in providing 'behind the scenes' support for selection services, contract and permanent placements for mid-tier recruitment processes. 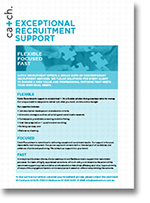 Our Exceptional Recruitment Support is a flexible approach that offers value for money. The support is designed to deliver just what you need, when you need it, on time and on budget without compromising on the attention to detail and quality you would expect. Our support is focused, dependable and transparent. The benefits for your organisation is that this approach attracts a talented pool of candidates and enhances client brand positioning. 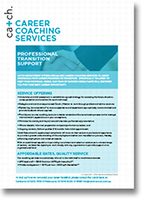 In today’s rapid business climate, clients need a quick and flexible service to support their recruitment processes. Our team of highly experienced consultants will work with you to determine the extent of the recruitment support required and deliver a tailored solution that drives efficiency and value. Improved clarity of scope of the engagement leads to an increased pace in execution without compromising the outcome.